Avy was our "Big Dog" and she leaves a big hole in our hearts. Not particluarly fond of other dogs but quite accepting of her kennel mates Avy was a little misunderstood! When she had puppies in tow she would take every opportunity to run as far away as possible to enjoy some "Avy" time, but was always happy to return to mothering duties. 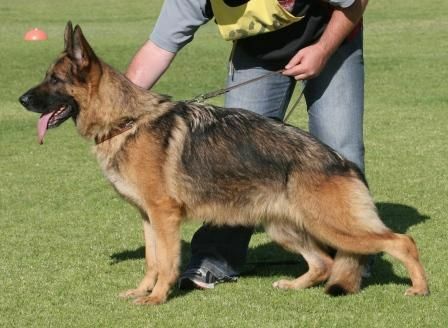 In 2008 at the GSD National Show and Trial she finished Excellent 8 behind our Storm who took out the Gold Medal. Excellent 9 was her mother, Ch Vonepta Sheeza Mona AZ Class I. Loved her antics in the house and we would have enjoyed having her around for a few years yet, but alas that was not to be. She lives on through her daughters and grand daughters. Rest in Peace our beautiful girl.